This article shows you how to copy DVD to a new disc, DVD folder or ISO file and to burn DVD folder or ISO file to DVD. 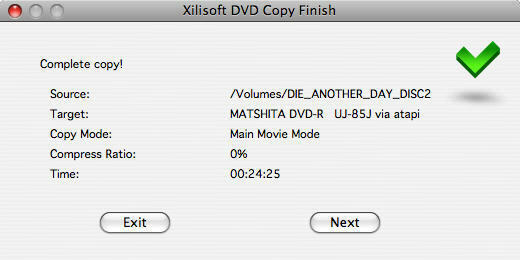 Before all, install Xilisoft DVD Copy for Mac. Step 1: Click and choose to open DVD folder in the "Source" box to select your DVD disc. Step 2: Click to select the DVD±ROM Drive in the "Target" box. Step 3: Click "Main Movie Mode" button to get the main movie. Otherwise, select "Full Movie Mode" if you want to copy entire movie. Click the triangle on the right of the interface to expand the "Setting" panel, and select the "Temporary File Folder" to save. "Audio" and "Subtitle" mean that you can select all, no or part of them to copy. If you want the DVD copy to contain DVD menu, check "Include Menu". Meanwhile, checking "Skip Menu" means that the player will skip menu when playing copied DVD. Step 5: After finishing all these, click the large round button at the bottom right. 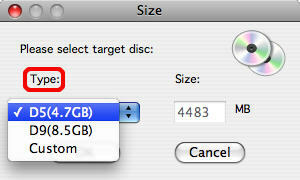 Choose the type of the target disc you want to insert in the "Size" dialog box that appears. Then, the software starts the first process "Reading". Step 6: When the "Reading" process is done, the "Waiting for disc" dialog box appears, as shown below. Insert one empty DVD disc. Click "Retry" to continue. Tip: If the disc is not an empty one, it will remind you of erasing or not. Step 7: After finishing all these, the software begins copy. After copy is over, the pop-up dialog box will remind you of exiting or copying another new disc. The steps mentioned above are a whole DVD-to-DVD process. 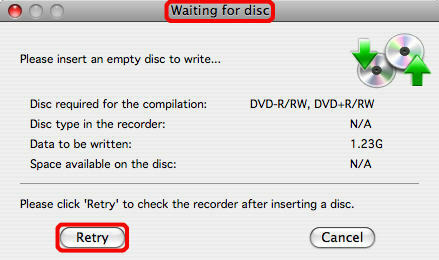 If no empty disc is available, change the target to save as DVD folder or ISO file on your Mac for access next time. The following is a guide to teach you how to burn a DVD disc from a DVD folder or ISO file. Step 1: Insert one empty DVD disc. Step 2: Click to select the source file: DVD folder or ISO file in the "Source" box. Step 3: Click to select the empty disc in the "Target" box. Step 4: Concerning the detail of following steps and setting, please refer to the first "Step 3" and "Step 4" in the part of "Copy DVD from one disc to another". Step 5: Well, finish all steps above and start to burn.